HTML5 Canvas is used to draw Text in multiple format. HTML5 canvas can control font, color, size horizontal alignment, vertical alignment. fillText() method sets the font style and property in canvas area. Find the Example. Output will look as below. 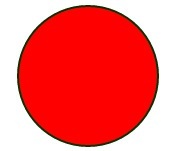 We can draw Circle with HTML5 canvas by arc() method. This method takes five parameters: x and y are the coordinates of the center of the circle on which the arc should be drawn. Find the example. To create a path with HTML5 Canvas, we can connect multiple subpaths. We can use the lineTo() method to draw straight lines on a canvas. moveTo(x,y): defines the starting point of the line in canvas area. lineTo(x,y): defines the ending point of the line in canvas area. Find the code how to use. The starting point position is (0,0), and ending point position is (500,300). Then use the stroke() method to actually draw the line. See the output. HTML5 canvas create gradient image to use one are more color, we can fill circles, rectangle and lines. There are two different types of gradients. To create a linear gradient with HTML5 Canvas, we can use the createLinearGradient() method. Once we have created our gradient, we can insert colors using the addColorStop property. Find the example. The output will look as below. HTML5 Canvas creates a radial gradient with combination of multiple color, we can use createRadialGradient() method. Radial gradients are defined with two imaginary circles - one starting circle and second ending circle, in which the gradient starts with the start circle and moves towards the end circle. Example is given below.